As you drift down the Chobe River and spot incredible wildlife scenes, you’ll be able to completely relax in an intimate river safari experience. With only a small number of guests per boat staying in one of the three Chobe Princesses is like being on your very own houseboat. The entire boat can also be booked exclusively, giving you your very own private villa on the water. The beautiful combination of tasteful decor and laid back charm will inspire relaxation as soon as you step foot aboard one of the Princesses. Even leaving your cabin will be hard as you can gaze at the changing African landscape from the comfort of your bed. 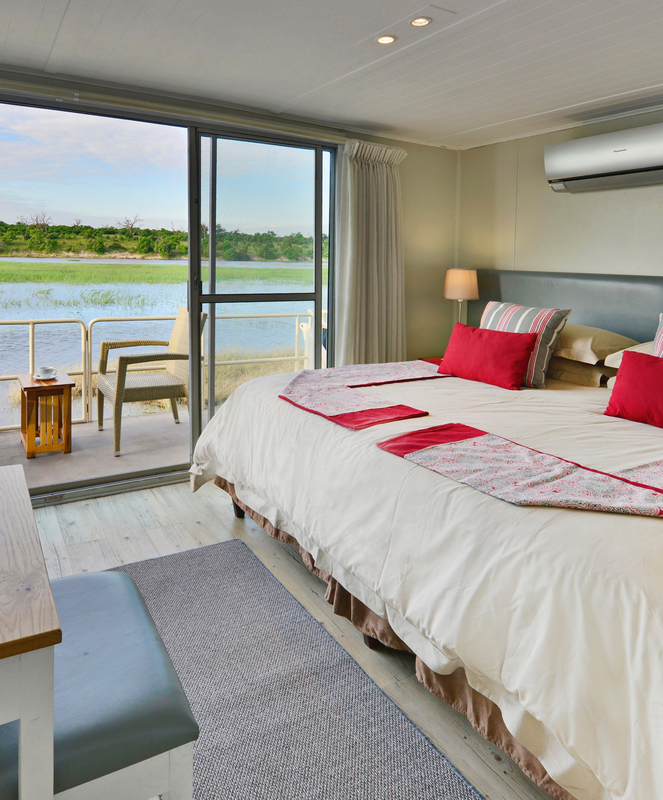 As you lie in bed and drink in your striking surroundings, you’ll find it very hard to leave the comfort of your cabin on board one of our Chobe Princess houseboats. Tasteful décor cleverly combines local flavour with contemporary design, and the overall focal point is the large sliding window that frames the changing African landscapes perfectly. Two of the 18-metre Chobe Princesses contain four cabin suites, while the third is slightly larger with five suites. Each cabin sleeps two people – either in a king-sized bed, or in two single beds if you prefer. Along with air-conditioning, cabins are fitted with mosquito-proofed windows and en-suite bathrooms with a shower, toilet and basin. Toiletries are provided for your comfort, as well as insect repellant for a peaceful night’s sleep. Hairdryers are available on request. Head to the upper entertainment deck of your houseboat and relax in the spacious lounge and bar, as you take time to simply sit back and soak up the scenery. This deck also has an open-air dining area where you can enjoy superb seasonal meals prepared by our experienced chefs. Want to cool off? Take a dip in the plunge pool before unwinding on a sun lounger with an ice-cold drink served all day from our bar. Our lounge area comes with comfortable couches, tables and chairs that are the perfect place from which to enjoy a spot of game viewing or simply to spend time with family and friends. As night draws in, enjoy some unforgettable stargazing under a vast African sky. When you’re on holiday, the food you eat and the meals you enjoy become part of your memories. That’s why as a guest on one of our Chobe Princesses, we make sure that every one of the three hearty meals we serve per day are unforgettably delicious – along with the drinks and snacks we provide in between. At sunrise, enjoy a warming cup of tea or coffee with wholesome rusks and biscuits before departing by tender boat for game viewing and other excursions. After an exciting morning – or even if you’ve chosen to stay on board and lie in – settle in on the deck for a fresh continental buffet or a hot English breakfast if you prefer. Lunch and dinner are set menus with a single option, so please do let us know any dietary requirements before you arrive. Unfortunately, due to our remote location, we’re not able to cater for Kosher and Halaal meals. In keeping with the relaxed atmosphere of the Chobe Princesses, we don’t serve high tea at a set time. Instead, we have tea, coffee and home-baked goodies readily available at the bar area of the entertainment deck for you to enjoy at any time of day. After sipping on a traditional African safari sundowner, sit down to a three-course evening meal as you’re serenaded to the sounds of hyenas, elephant and perhaps even lion nearby. After dinner, enjoy a coffee and a nightcap before heading to your cabin to round off the perfect day. With only a small number of guests per boat staying in one of the three Chobe Princesses is like being on your very own houseboat. The entire boat can also be booked exclusively, giving you your very own private villa on the water. As you drift down the Chobe River and spot incredible wildlife scenes, you’ll be able to completely relax in an intimate river safari experience. Each houseboat has a minimum of two smaller “tender” boats for use on daily excursions that take your fancy: mark off over 450 bird species found in this wetland paradise, try your hand at landing a tiger fish, or capture Africa’s unique beauty on a photographic safari. Whatever you choose to do, your day trips will be personal and flexible because you’ll be sharing the tender boats with a small number of guests. Alternatively, simply laze on a deck chair with an ice-cold drink in hand as you soak up the tranquility that surrounds you. Each cabin on board the Chobe Princesses is tastefully decorated in a contemporary style, and each has its own private view onto the ever-changing landscapes beyond. As you lie on your king-sized bed, spot an elephant grazing on the riverbank nearby, or see a fish eagle diving for its prey. On the upper entertainment deck, a spacious lounge and bar area encourages you to take time out while there’s also a plunge pool that’s perfect for a refreshing dip. After a day spent doing as you please, fall asleep with the calls of hyena or even a lion drifting through the open doors of your cabin. Our Chobe Princess houseboat itinerary is flexible so while we have a range of activities on offer, you can choose just how much you want to pack into your holiday or how relaxed you want to be. Perhaps you want to enjoy a water-based safari or a village tour on the Namibian side of the river? Or perhaps you’d prefer a spot of bird watching or fishing instead? You may even decide to simply remain on board and soak up the spectacular view as the Chobe Princess houseboat glides its way along the banks of the Chobe River. If you arrive with the 13:00 and 14:00 transfers, you’ll be served lunch, while if you’re transferred at 15:00 or 16:00 you’ll be served a selection of snacks. Once all our guests have boarded in the late afternoon, and if the weather permits, we’ll go in search of some big game. This is the perfect time of day to make the most of that golden glow of the African sunset by getting some iconic shots of the animals as they gravitate towards the river before night falls. After the sunset cruise return back on board and freshen up before meeting your Captain on the upper deck. After a safety briefing, you’ll make your way to the dining room where you’ll be served a delicious three-course plated dinner along with an excellent choice of wines. Finish off with a hot drink or nightcap at the bar before retiring to the night sounds of Africa in the distance. We know that some guests like to watch the sunrise as they sip on their coffee while others like to take a more leisurely approach. That’s why we let you choose your morning activities, depending on the type of holiday you’re searching for. Perhaps you want to enjoy a water-based safari or a village tour on the Namibian side of the river? Or perhaps you’d prefer a spot of bird watching or fishing instead? Or for the more adventurous a walking tour to a 2000-year-old baobab tree? You may even decide to simply remain on board as the Chobe Princess houseboat glides its way along the banks of the Chobe River. After your morning activities, enjoy lunch on board while using your unique vantage point to spot wild animals and drink in the expansive views. Join our guide in the afternoon for a water-based safari on a tender boat where you can get up close to an array of wildlife, including some of the 120 000 elephants for which the Chobe is well known. After a delicious dinner, settle down for a restful and tranquil night in your cabin. Enjoy a morning cruise during breakfast as you do your last bit of animal spotting and take some memorable pictures. Bid our crew a reluctant farewell and then make your way via tender boat to the Namibian Immigration Office. Once you’ve had your documents stamped you’ll be transferred via tender boat to the Kasane Immigration Office, where you’ll have your documents stamped once again before entering Botswana. You’ve made a wise choice – you have a whole extra day to enjoy the delights of Zambezi Queen. After a hearty breakfast, head off to experience those activities you didn’t manage to fit in yesterday: enjoy a water-based river safari by tender boat, a village or walking tour, go bird watching or fishing for tigerfish or bream. Return for lunch on board and some relaxation time before the afternoon activities start. Again, you have the choice between tiger or bream fishing, a village or walking tour, game viewing by tender boat or bird watching. Enjoy a morning cruise during breakfast as you do your last bit of animal spotting and take some memorable pictures. Bid our crew a reluctant farewell and then make your way via boat to the Namibian Immigration Office. Once you’ve had your documents stamped you’ll be transferred via boat to the Kasane Immigration Office where you’ll have your documents stamped once again before entering Botswana. With only a small number of guests per houseboat, a stay onboard one of our three Chobe Princesses provides a sense of intimacy and exclusivity for every guest. Larger groups also have the opportunity to book the entire houseboat for their very own private villa on the water. The Chobe Princesses sail on scheduled weekly departures every Monday (two-nights), Wednesday (two-nights) and Friday (three-nights). Our rates vary throughout the season, so please take this into consideration when planning your stay. For further information regarding our rates, itineraries, child policy, activities, payment information and other important details, please select your applicable travel date below. Rate is per person sharing for 2 nights. All rates are in South African Rands (ZAR) including 15% VAT. Departs on a Monday & Wednesday. Only available dates are listed. Rate is per person sharing for 3 nights. All rates are in South African Rands (ZAR) including 15% VAT. Departs on a Friday. Only available dates are listed.